Some Christians insist that creationism is divisive. Well, standing for the truth is divisive. But so was Jesus! (Luke 9.62, Matt. 10.34-39, Luke 11.23) People are ignorant (sometimes willingly) that creation is foundational to the gospel message. Many have compromised on a straightforward reading of God's Word, insisting on adding to it so they can have their own interpretations and accommodate atheistic interpretations of scientific evidence for an ancient Earth (Prov. 30.6). The Bible does not teach an ancient Earth, nor does it accommodate theistic evolution. There is no need to please men and dishonor God (Eph. 6.6, Gal. 1.10, Col. 3.23). Christians are to base our faith on God's Word (2 Peter 1.19, 2 Tim. 3.16), which does not change (Isaiah 40.8, Mark 13.31). Consider this: Philosophies of science continually change. If someone bases their faith and their understanding of the Word of God on what "science" has given, what will become of their faith when the false revelations of science change again and again? People are falling away from the church. One very big reason is that they have been told lies that "science" has disproved the Bible, that Genesis is just mythology, the Bible is full of contractions, the lie that science proves evolution, and even that God does not exist. For honest seekers, information showing that such things are false is available. 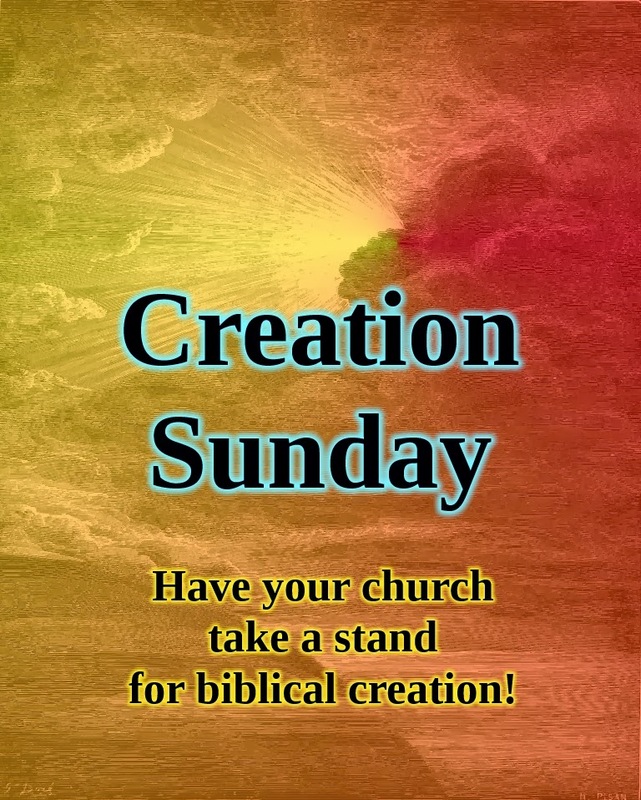 Let's make February 9, 2014 into "Creation Sunday"! We're calling for pastors, church leaders and anyone else to encourage their churches to take a stand for biblical truth. There is information on this site about how Genesis and creation are important to a proper understanding of Scripture, and I recommend that you read about Creation Sunday here, too. The Institute for Creation Research has a series of excellent, very short, fast-moving videos called "That's a Fact"
These links should give you plenty of information to get started. Feel free to link to this page and the others, and grab the graphic at the top (scaled down to fit this page).